One of my favorite new guns released this year really has nothing to do with Concealed Carry and is from Stag Arms. We got to meet up with them both at Industry Day at the Range and on the showroom floor and I must admit that I was impressed. They brought out their new PCC (pistol caliber carbine) lineup. They have different models out the wazoo in calibers chambered in 9mm, .40 S&W, .45 ACP, and 10mm, as well as in multiple barrel sizes. That's right, a 10mm pistol caliber carbine–something die hard 10mm fans have been asking for, for some time. We all got to shoot it, and it performed exactly how it was supposed to. They take Glock mags, which is great news because they can be found anywhere and come in different capacity sizes. There are essentially two different size frames that Stag is working off of. The small frame allows for 9mm and .40S&W, while the large frame receiver is for the .45ACP and 10mm. And, stretching things out even farther, there are three different size barrels slated to be offered. They'll be available in 5.5, 10.5, and 16 inch configurations. Those shorter options are great for home protection and any of them would be great for a truck gun, depending on your mode of transportation. As of this writing these PCCs aren't yet available. But, they will be available soon, maybe only a month out. You can find more info on their website, here so if you're in the market make sure you check their site, often. 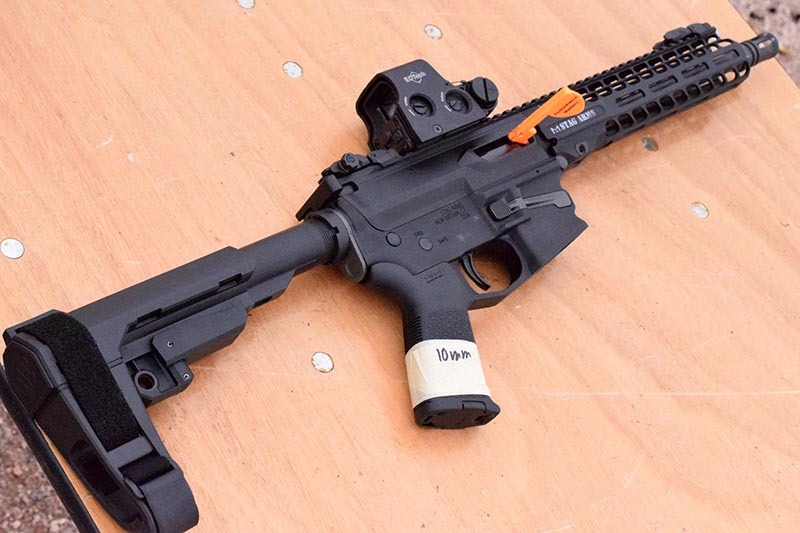 What do you think about these new offerings from Stag Arms? Does the 10mm AR platform PCC get you excited? Let us know in the comments below. I have not seen anyone ask about MSRP, and I would like to know msrp of the left hand 10 inch pistol version of the 10mm pcc. I would also like to know if it is compatible with milspec AR-15 charging handles and triggers.